Below is summarised information based on published rules applicable to the majority of events. Refer to each organisation’s rules for details and all possible variations�(competition information includes which rules apply). * � = At WA record status competitions you are allocated time before official start for sighters. ** = For shortest metric distances (50 & 30 metres) you may shoot 1 end of 3 arrows. AGB and WA competitions are based on score whilst BLBS shoots are usually number of hits then score then golds. If a competition is assigned “record status” you can claim either national or international records. You can only gain Master Bowman and Grand Master Bowman qualifying scores at record status shoots. Other awards may also be available (see below). To score golds: Imperial is any arrow scoring 9; metric is any arrow scoring 10 (and ‘X’s must be in the inner X ring). Note for scoring: if shooting Imperial�rounds�(5-zone scoring) then even hits=even score, odd hits=odd score. At Warlingham we shoot both AGB Imperial and Metric rounds. A rather relaxed form of archery that also takes skill and power to reach and hit the target. Under AGB rules you shoot at a 12” flag. Can be 1 or 2-way. Gents shoot at 180 yards; ladies at 140 yards and juniors shorter depending on age and gender. 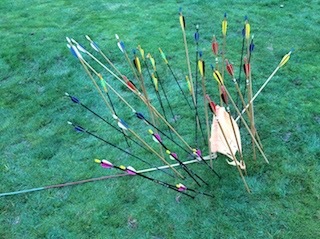 A round consists of 36 arrows, shot in 6 ends of 6 arrows and 6 sighters are permitted for each round, each way. So a double 1 way shoot = 2 rounds. There is 5 zone scoring, 5 to 1, based on distance from flag (within 18” = 5; �3’ = 4; �6’ = 3; �9’ = 2; �12’ = 1). �An arrow’s score is determined by where the arrow shaft enters the ground - if it is lying flat on the ground then the position of the pile determines the score (the 1 in the picture scores 4). Line cutters are awarded the higher score. For BLBS you shoot at a target 30” diameter, white with a central 4” black spot, raised at approx 45 degrees. Is always 2-way, double (2 rounds of 36 arrows), no sighters. Gents shoot at 180 yards; ladies at 120 yards.�Concentric rings are marked at 30", 4', 7', 10' and 13' from the centre.�Scoring is similar to AGB but if an arrow touches the target (clout) it scores 6. WA Clout have similar but essentially different requirements (distances by bow type/gender/age, size of rings). Usually involves a pleasant walk around woodland looking for targets: 3-D animals, 2-D paper animals or zoned targets. Each shoot is run under a particular organisation’s rules (AGB, NFAS, WA) and each have their own scoring system. The Surrey County field shoot (AGB rules) is held on the 1st Sunday in November at Box Hill. Kent Archery Association also organise a field shoot in October. Note 1: see AGB rules for more info.